Bookshop Santa Cruz presents an evening with Madeleine Albright, the United States' first female Secretary of State, who will speak about her book, Fascism: A Warning, a personal and urgent examination of fascism in the twentieth century and how its legacy shapes today's world. This ticketed event will take place at the Kaiser Permanente Arena and is cosponsored by The Humanities Institute at UC Santa Cruz and Temple Beth El. 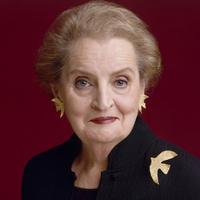 ABOUT THE AUTHOR: Madeleine Albright served as America's sixty-fourth Secretary of State from 1997 to 2001. Her distinguished career also includes positions at the White House, on Capitol Hill, and as U.S. Ambassador to the United Nations. She is the author of the New York Times bestsellers Madam Secretary, The Mighty and the Almighty, Memo to the President, and Read My Pins. ABOUT THE EVENT: Tickets are $23.00 and include 1 general admission ticket to the event and 1 pre-signed paperback copy of Fascism: A Warning. (The book is $17.99 and publishes on January 29.) All books will be distributed at the venue. Please note that Madeleine Albright will not be doing a signing at the event. Madeleine Albright conveys her brilliance with wit, charm, and warmth. A delightful evening! Curtis, due to the overwhelming response, this event has been moved to the Kaiser Permanente Arena. We will update the description. Your description of this events says it will take place at the Rio Theatre". But, the location given is the Kaiser Permenente Arena. Which is it?